First in a brand-new series from bestselling author MaryLu Tyndall, Forsaken Dreams launches readers on a romantic adventure as Colonel Blake Wallace leaves the war-torn South behind to build a utopian society in Brazil. But will unexpected dangers on the ship and the secret of one captivating lady keep him from beginning anew? 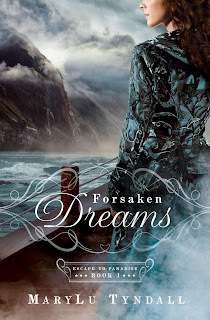 Visit author MaryLu Tyndall's blog, Cross and Cutlass, to follow her tour for her new book Forsaken Dreams. I am currently reading this one now, and it is a wonderful blend of romance and adventure, with a dash of faith mixed in! The characters of Eliza and Blake are very easy to like, and I love the historical atmosphere of how they are all struggling with the aftermath of the Civil War. It's written very realistically thus far, and the voyage has been eventful!!!! I loved Tyndall's Veil of Pearls, and I've been collecting her works ever since.